This Creamy Cucumber and Tomato Salad is simple, fresh, and easy summer salad, Russian style. Growing up, this was a staple on our summer table, with mom picking the tomatoes and cucumbers fresh from our garden. Now it’s a staple on my summer dinner table. There are many different recipes for Tomato Cucumber Salads from around the world. A popular salad is an Israeli Cucumber Salad which includes chopped tomatoes, onions and peppers. There are Greek recipes with feta and oregano. Also Italian versions with fresh basil thrown in the mix. These recipes all use a vinaigrette type of dressing. I love my Creamy Cucumber and Tomato Salad best! Dill is one of my favorite herbs, and is used extensively in Russian cooking. We tend to throw it into everything and this Tomato Salad is no exception. Many people don’t know how to use dill, and I think it’s and under used herb. It’s always growing in my garden, a perfect addition to this summer salad. When we moved to Australia, I heard people reference dill as ‘dill weed’. I had never heard of that before moving here. The term weed has a negative connotation to it. This is far from a weed! Dill is extensively used in Eastern European and Scandinavian cooking. Commonly used to flavor everything from soups, fish, salads and pickles. A common way to make Cucumber and Tomato Salad is using Sour Cream. While that works, my mom always used whipping cream as the dressing for this salad. Whipping Cream as a liquid, works perfectly to absorb the juices of the fresh cut tomatoes, onions and dill. The flavor combination creates a delicious salty flavored whipping cream dressing which I love to mop up with a crusty piece of bread. Trust me, you’re going to love it. You’ll never go back to sour cream dressing again. This is such an easy rustic recipe to make, especially with vine ripened tomatoes from the garden. It was always a side dish on our summer dinner table. 3 salad ingredients that are readily available everywhere. We even make this Creamy Cucumber and Tomato Salad when we go on a picnic. One thing I love about living in Western Australia is that there are gas barbecues available to use in parks and beaches, for free. So easy to enjoy an outdoor lifestyle, it makes eating fresh all the more enjoyable. We grab some steaks, these salad ingredients and we have a healthy outdoor dinner. I took these photos in the park when we had a picnic at the beach. It was easy to prep the uncut tomatoes and cucumbers and make this salad on the picnic table. This Creamy Tomato Cucumber Salad is best enjoyed when freshly made. 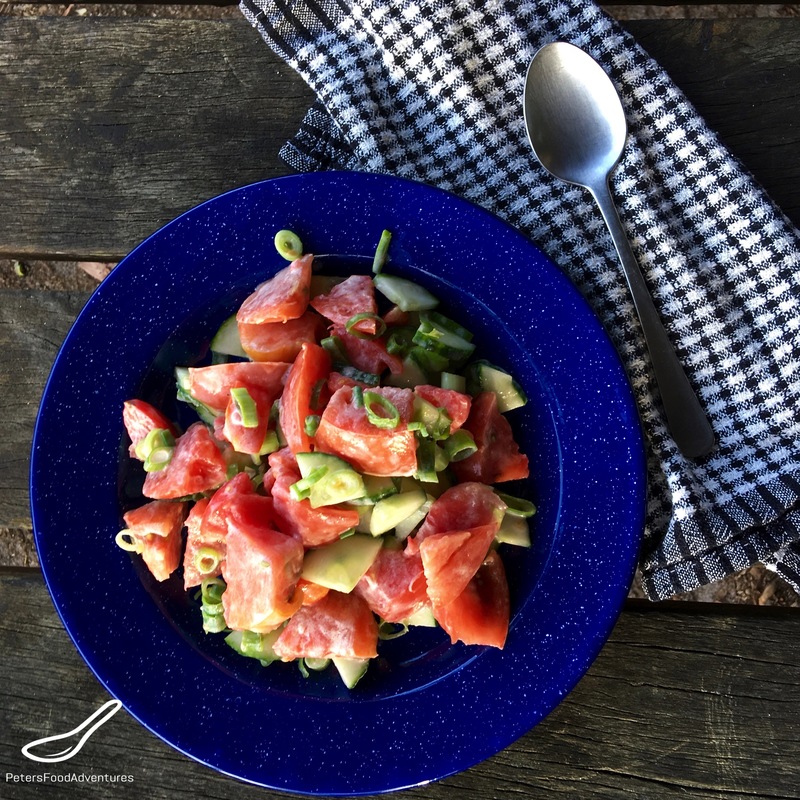 An easy rustic salad, made with tomatoes, green onions, cucumbers, dill and whipping cream. A tasty addition to your summer salad dinner recipes. Bon Appetit! Приятного аппетита! Cut the long English cucumber in half lengthways, then slice into pieces. Cut the tomato into chunky bite size pieces. In a medium bowl, combine tomatoes, cucumber and onions. Pour the whipping cream and mix in the chopped dill. Add the salt and pepper taste. This recipe shouldn't be made in advance, as the tomatoes get soggy. Serve immediately after preparing. Brings back the memories ???? Thanks so much Lucy! It’s an honour that your thought of me 🙂 Thank you. My mum (who is Polish) also makes salads with cream as a dressing. It seems a bit awkward, but is, in fact, tasty, especially if you add a pinch of salt AND a pinch sugar. I am curious what kind of cucumbers you Mum grew in her garden? Were they long and slick like we buy in stores now or ‘proper’ short ‘warty’ ones? haha! I think it’s funny the people have such a strong opinion about what is obviously a cucumber!